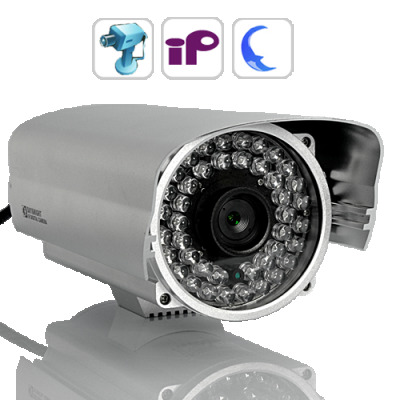 Successfully Added 720P HD IP Security Camera with Infrared Nightvision to your Shopping Cart. Easy to setup and use, feature-rich IP security camera with night vision and stunning 720P image quality! When you can't be there yourself, you can with this IP security camera and in high definition! Incredible High Definition Images: with 1280x720 resolution line scanning real-time output, everything looks amazingly clear with this IP camera, which helps you see every detail so distinctly that you will easily identify people and recognize objects, even in environments with very poor lighting conditions. Easy to Set up and Use: Simply plug connect the camera to a compatible router, then install the program on the software disk, and the program will generate an IP address for you. Copy and paste that IP address into your IE web browser and you can instantly view or record the camera's streamed videos - even if you're on a business trip at the other end of the world! With tons of advanced features, this IP camera is brought to you by Chinavasion at an astonishing low wholesale factory direct price. Click "Add to Cart" right now and we'll express ship your order within a day. Available from your source for high tech surveillance gadgets, Chinavasion. The mounting bracket of this product is not included, however it can be easily bought from your local hardware store. Recording camera output is done through your IE browser.